The NAP Foundation believes that it is very important that the history and future of the Amsterdam Ordnance Datum is preserved through education. The reference mark is a unique part of the national history of The Netherlands, important on both national and international levels. With the help of a number of partners, the NAP Foundation has been able to establish a visitors’ centre about the NAP. 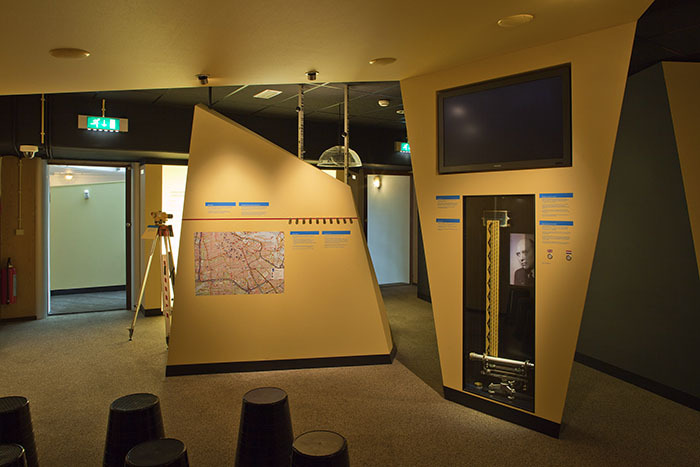 The interactive exhibition brings the history and future of the NAP to life with imagery and sound. Visitors will experience how confusing it can be if they are unable to determine their own altitude. Social aspects of the datum are highlighted, as well as its international character. The exhibition offers enough enjoyment for both young and old and is available in English and Dutch. The visitor’s centre also has a ‘classroom’ for school visits. Using three computers, a projector, a replica of the NAP-pole and many experiments, pupils from primary and secondary schools learn about the NAP while they are busy doing fun activities. The NAP Foundation has ensured that schools can visit the visitor center for a small fee. If you would like to visit the visitors’ centre with a group, you can make a reservation by phone 06-83085155 or by filling out the registration form: Would you like to make a booking? No tours are currently being given due to staff shortages.